When fantasy author Robert Jordan died, it fell to one of his fans to finish Jordan's epic Wheel of Time series. 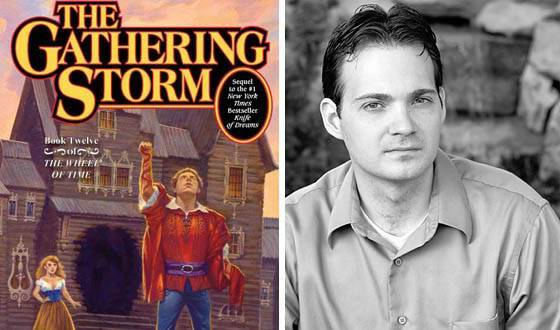 Brandon Sanderson explains why he split the last novel into three -- the first of which, The Gathering Storm, will be released this November. Q: Were you ever reluctant to take on this project? A: I spent a long time thinking, "Can anyone do this?" And my answer came out "No." But if someone else can try, I wanted it to be me. My goal has been to get the characters to feel like themselves when you read them. But it's like a different director directing the same actors and using the same script. You're going to end up with two different movies. Q: Did you have to change the way you write? A: I didn't want to imitate Robert Jordan's style -- I think that would turn into parody. But I needed to be more descriptive. The Wheel of Time books are lavish in their concrete sensory descriptions. And that's had a strong influence on my own writing: I just sent a couple of pages of something else to my editor, and he wrote back and said, "Wow, you've changed." Q: Did you struggle with any aspects of the series? A: The biggest struggle was the sheer weight of characters. I was working on Perrin's viewpoint at one point, and Jordan's editorial assistant sent me this file filled with dozens and dozens of names of side characters for him that had not even appeared in the book yet. It's like juggling boulders, because there's so much weight to each of them. Q: Have you written the long-awaited Tarmon Gai'don (The Last Battle) scene yet? A: That's going to be the third book of the series. The first two books are about bringing all these plotlines that have spread out over 11 books back together. I'm working on the second third, so I'm at the point where you can spit across the line and hit Tarmon Gai'don, but I haven't actually written any of it yet. Q: Robert Jordan was adamant that he was going to write only one more book in the series. Did you ever wonder what he was thinking? A: [Laughs] I have. I think that if he had been around, there's a chance he might have been able to get it into one book. But only because of his illness. If he would have had all the time he wanted, it would have been this long. It was always intended to be huge, but for me it was easier to write it piece-by-piece. Q: What are the biggest questions you wanted answered by the end of the series? A: I was really curious about Moiraine and her plot line. Her disappearance was so open-ended. I wanted to see some meetings: Elayne and her mother, Tam and Rand, getting Perrin and Mat back together. I can't say whether or not that happens, but I was looking at them. In some cases there were opportunities and notes for it, and in other cases... I'm not going to force it. Jim did include in his notes what happened to Asmodean, and his widow made the call on where to put it in the book. Q: Universal has optioned the series. Do you think it's possible to make a movie of this scope? A: It's a difficult project. The people who are producing it seem very focused on the series, and they've put some of my worries to ease. It seems impossible, but I would have said the same thing about The Lord of the Rings. Impossible things can come to pass. Universal wants this to be a fantasy tentpole, and if that's really the case I can see them splitting books and giving this series the attention it deserves. Q: Your next novel, Warbreaker, comes out in June. What inspired it? A: I wanted to tell a story in a world where color was the magic. I like the metaphor of color as life -- when something dies the color fades, and that became a magic for color bringing things to life. I also liked the idea of a god who didn't believe in his own religion -- somebody who was worshiped, but who did not accept that worship of himself. Q: What do you have planned after you finish Wheel of Time? A: My next series will be The Way of Kings, which is the start of a big epic for me. I've plotted it as ten books. Fantasy writers, we get into this business because we love the big epics. We grow up reading Brooks and Jordan, and we get to the point where we say, "I want to do this myself." Click here to visit Brandon Sanderson's website, where you can learn more about Wheel of Time and all his other fantasy projects. "One pretty woman means fun at the dance. Two pretty women mean trouble in the house. Three pretty women mean run for the hills."